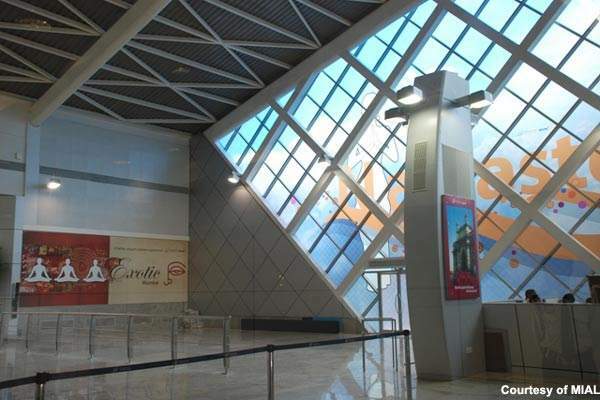 The departures area in terminal 1-B of Chhatrapati Shivaji International Airport. The departures area in terminal 2 was designed by ADP. 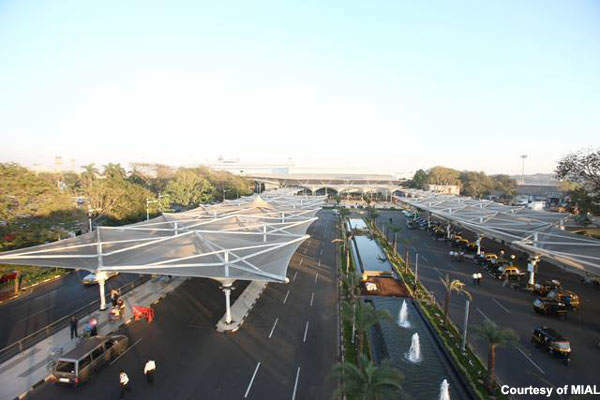 The drop-off and pick-up areas at Chhatrapati Shivaji International Airport. New architecture at the old Chhatrapati Shivaji International Airport terminal 2. 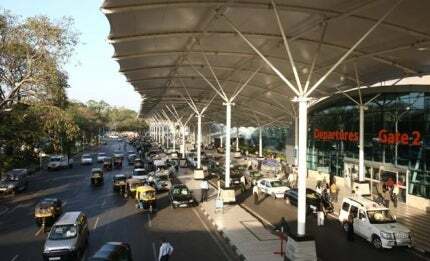 Chhatrapati Shivaji International Airport is now able to handle about 40 million passengers a year. Chhatrapati Shivaji International Airport (CSIA) in Mumbai, Maharashtra (formerly Sahar International Airport) is spread over an area of 7.6km² (it is India’s largest airport) and is located inside the city, towards the north with convenient access to the rest of the city by road and the local rail network. The airport handled 30.75 million passengers and 600,000t of cargo in 2012. 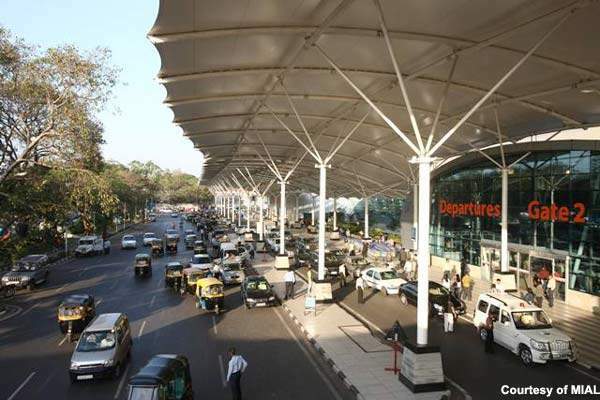 "India is currently upgrading many of its major airports to satisfy international standards and provide world-class airports for business and the tourist industry." India is currently upgrading many of its major airports to satisfy international standards and provide world-class airports for business and the tourist industry. 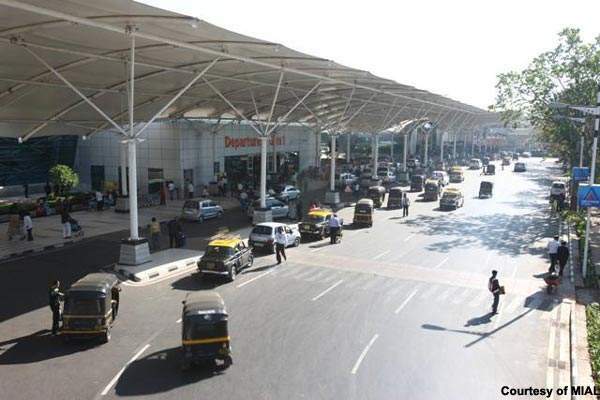 As far back as 1996 the Airports Authority of India (AAI) had been considering the modernisation of CSIA as it is an important hub for the major industrialised states of Maharashtra and Gujarat and also for Indian domestic traffic. In 2003 the AAI approved a $7.6bn modernisation plan for the airports at Delhi and Mumbai and the government decided that the airports should be modernised and operated under a joint venture lease arrangement between the AAI and private consortia, who would provide the majority up to 74% of the funding in return for an operating concession for 30 years under a Build Own Operate Transfer (BOOT) arrangement. The bidding process began in May 2004 and after some political machinations that caused delays the winning consortium was chosen in January 2006 and was GVK, Airports Company South Africa (ACSA) and Bidvest. The GVK consortium set up a Special Purpose Vehicle (SPV) in March 2006 called MIAL (Mumbai International Airports Limited) to carry out the upgrade project. The modernisation project was completed in January 2014. MIAL (GVK 37%, Bidvest 27% and ACSA 10% – Clifford Chance legal adviser) announced an investment of $1.26bn for the project in October 2006 (consortium members contributed $242m to the project). On 2 March 2011, GVK increased its stake to 50.5% by acquiring 13.5% interest from Bidvest. The debt for the project amounts to $1.016bn and is being provided by the Industrial Development Bank of India (IDFC) and UTI Bank over a period of 24 years. ABN Amro was financial adviser to the government and Amarchand & Mangaldas & Suresh A Shroff & Co (AMSS) provided legal services. The master plan, which was developed by Netherlands Airports Consultants BV (NACO), was unveiled in October 2006 (also reviewed by Changi Airport of Singapore who advised on operations and management). There were two main stages. The international Terminal 3 at the Indira Gandhi International Airport (IGIA) in New Delhi, India, was opened in July 2010. 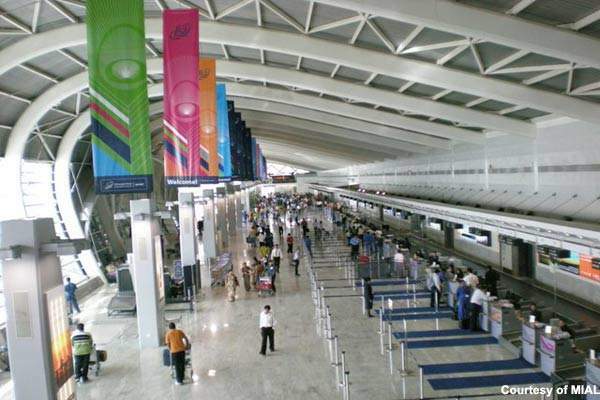 The interim stage was completed by the end of 2008 and included the commencement of refurbishment and construction at terminal 2, refurbishment of terminal 1A to upgrade and expand facilities such as check-in counters and boarding bridges, set up temporary cargo facilities to add capacity, upgradation of the airside runway facilities such as rapid exit taxiways to increase runway capacity and the enhancement of city side facilities such as multilevel car parks. The second phase included construction of a brand new (T2) terminal building for both international and domestic passengers, a dedicated link from the Western Express Highway to T2 at Sahar, enhancement of the airside facilities by moving the Air Traffic Control (ATC) tower and the construction of a parallel taxiway, development of infrastructure on the city side, construction of permanent cargo facilities and a new domestic terminal 1-C. The new terminal 1-C was inaugurated on 17 April 2010. Built over an area of 297,194ft², the terminal 1C has three levels. It has six new passenger boarding bridges that connect terminals 1A and 1B. The project also added 106 stands for aircraft (67 in contact and 39 remote), 51 boarding bridges (previously there were only 18), 316 check-in counters and parking space for 12,000 cars. Mumbai airport is equipped with two crossing runways which are called 09/27 and 14/32. Runway 14/32, (2,925m, 9,596ft) is the one that runs between terminals 1 and 2. The main runway 09/27 (3,445m, 11,302ft) intersects 14/32 just south of the terminal buildings. Reconstruction of the primary runway (09/27) was completed on 30 May 2011 after seven months of work. The runway was increased in width from 45m to 60m with a runway shoulder width of 7.5m added on each side. "Reconstruction of the primary runway (09/27) was completed on 30 May 2011 after seven months of work." A workforce of 120 engineers and officials and 800 field workers was employed for the reconstruction. More than 200 types of equipment and machines were utilised. The second runway 14/32 was reconstructed in 2010. The runway shoulders on both sides were widened from 7.5m to 15m. Five new taxiways including two new rapid exit taxiways were constructed. MIAL has incorporated a parallel runway as part of the master plan but there are obstructions to this part of the plan including land acquisition and rehabilitation of slums as well as relocation of a number of airport facilities. The parallel runway remains an active part of the plan but meantime the cross runways are being upgraded as much as possible. The airport has two terminals, domestic terminal 1 (1-A and 1-B) and international terminal 2 (2-A, 2-B and 2-C). The construction contract for the reconstruction of terminal 2 was awarded to Larsen & Toubro and the design was completed by Skidmore, Owings and Merrill (SOM).The new terminal was inaugurated in January 2013. The estimated cost of the project was INR5.5bn ($894.3m). International operations at T2 will start from February 2013and domestic operations will start by 2015. The terminal has208 check-in counters, 60 immigration counters for arrivals, 72 immigration counters for departures, over 20,000m² of commercial space, 47 escalators, 161 elevators and parking space for 5,200 cars.